I’ve been following a LCHF (low carb high fat) way of eating for six months now with great results and benefits. In South Africa, this is referred to as banting. Having an online presence it would make sense that I belong to many Facebook groups on the topic as well as have a personal Facebook page where I post recipes or articles. I have however witness how people appear to have lost the ability to think for themselves. On various forums, a post went round about ‘flat tummy water’. Believe me after six months you have drunk every conceivable way to drink water. The ‘flat tummy water’ is merely water you have flavoured with a few banting friendly items like lemon, cucumber etc. It is not going to make your tummy flat after losing 20kg or 50kg! You will, I believe, be exceptionally well hydrated however. To me, you have three options. 1. Exercise I am sure cardio and weights will be greatly beneficial but after numerous pregnancies and cream cakes I don’t think your skin is just going to retract and look like a FHM model in soft lighting. 2. Accept yourself as you are and forgive yourself for abusing the body you were given. I’m still working on that! 3. Save for some plastic surgery and remove the skin. I always say ‘cut my stomach right off’. Now, I can admit that in the future I would love me some cosmetic surgery to take my breasts places they have never been and to remove the excess skin from my stomach…. (We have a hate/hate relationship) but doubt I would ever have enough money to do so. It is one thing to need information about a subject you are not familiar with… I also understand the desperation but it is quite another to not THINK, use common sense, research and make an informed decision. Please. Think. Repeat. Research. Repeat. Do this until you feel you can make an informed decision using knowledge and common sense. You didn’t gain 50kg overnight and you not going to get rid of it (and have a flat stomach) by tomorrow morning. 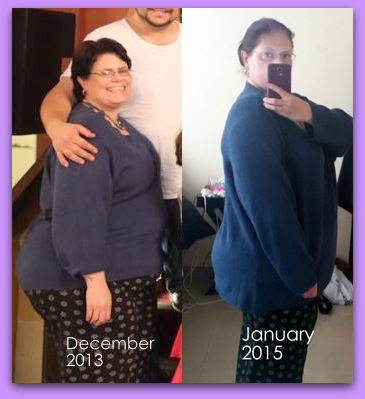 I started on 30 June 2014 and I had lost 30kg… and gained 3kg in December 2014. Since I have lost 2kg. I’m good with that. Believe me I paid for the nonsense I ate in stomach ache and heartburn more than the scale can torture me. Besides kg’s lost, I have gained normal readings for blood pressure, thyroid, sugar, cholesterol and less stomach ache…. for the first time in many years. No, I am far from perfect and while I do my best to cut out carbs and sugar, I fall down plenty. I will have birthday cake and carry on after. I am not dead, nor angel Gabriel. I’ve lost many more cm’s than kg’s. I fit into clothing I had before my eldest son was born 21 years ago. I don’t know why and I don’t really care. 🙂 I am still however an overweight Wench with another 30kg to go. No, I don’t exercise. I should, and yes I am lazy. Yes, it would be much better if I did. I do not have a goal weight. I will know when I get there. Yes my husband is proud of me. He has also joined in and stopped drinking 2l of Coke a day and I am HUGELY proud of him. Don’t be a sheep and definitely draw the line at goats! Just stumbled upon your blog. Love it! I, too, low carb. Weight has been a constant struggle my whole life. I mean, when you’re 9 years old and weigh 100 pounds, you’ve got problems. Keep up your good work, and thanks for inspiring me! You are the best I’m so extremely round of you!! Omg lol proud not round!!! LOL!!! As usual I love your writing!! You are so right, there is no quick fix for the damage we have done to ourselves over the years! Well Done on your amazing achievements! Far more important that the number on the scale is your sense of achievement and self love because you are being good and kind to yourself!! So very very proud of you!!! loved your blog puts things into perspective. I love research so I have been Banting for 2months lost 7kg and 31 cm but health , energy wow I am on top of the world.